Join our Re-open the Woodhead Line for just £10 a year (£5 concessions) to support our work and have a say in how our group works. A restored Woodhead rail corridor is vital for improving connectivity across the North. Colin Elliff of High Speed UK will outline plans for new trans-Pennine links for passengers and freight that will transform the local economy and bring major environmental benefits to the High Peak constituency. All High Peak parliamentary candidates invited. LET'S GET THE HIGH-SPEED RAIL STRATEGY RIGHT! Recent policy announcements outlining proposals for High Speed Rail show that clear thinking and a sound engineering strategy are fundamental requirements for achieving the long-term benefits of a properly integrated network. The High Speed UK strategy is already in existence at a detailed level. We are happy to offer a presentation given by Colin Elliff BSc CEng MICE, of High Speed UK, that will provide clear insight into the issues involved and the best solution. This presentation will be under the auspices of the Re-Open the Woodhead Line group, as it is clear that the basic aims of the Woodhead project are best served in association with the wider HSUK strategy. THURSDAY 16 TH APRIL @ 7.30 P. M.
Chair, Reopen the Woodhead Line. 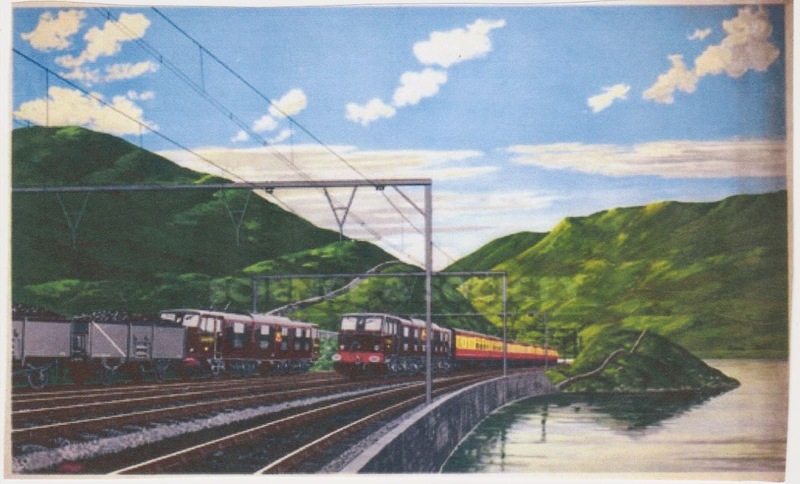 DO FUTURE PLANS MATCH THE 1950'S VISION FOR THE WOODHEAD LINE? The Chancellor has recently made a new announcement, proposing an east-west high speed rail link to be added to the existing HS2 plans. He gave no details, but he mentioned Manchester and Leeds as being likely to be involved. At this month’s meeting we thought we should give this announcement a guarded welcome. The route we want established is, of course, Manchester to Sheffield. However at the very least Mr Osborne is finally recognising the need to develop east-west rail communications in northern England. There is no denying that we are chasing a moving target. We want to associate political and commercial movers and shakers with our campaign, but we are in no position to be precise about the finer detail of what we would like them to associate themselves with. In fact this may not be entirely a bad thing. We are not trying to unmake any entrenched plans or get any firm decisions reversed. While proposals are still fluid we need to look for ways of making sure that they develop in ways that suit what we are trying to achieve. However if we want allies we need to have something to offer them. So who else wants, or might want, a Manchester to Sheffield link? Operating from west of the Pennines we have always ‘thought Manchester’. In fact it may be that ‘railway consciousness’ is stronger in Sheffield than it is on the west side. Obviously this has to be worth sounding out, at least, so our next move will be to see who we can find in Sheffield who shares our ideas. One thing that we definitely have got going for us is the tremendous amount of detailed work that has been done by our in-house civil engineer Colin Elliff. Colin’s scope is much wider than ours, but his proposals include what we are looking for. So Sheffield here we come. Or join our Facebook page. • To reduce the environmental impact of transporting people and freight across the Southern Pennines. • To create a means of access to the northern half of the Peak District National Park for non-car users, cyclists and the disabled. conurbations of Longdendale and Greater Manchester and the Upper Don Valley and South Yorkshire. • To restore the competitiveness of trans-pennine rail passenger journey times. • To make rail-freight a more attractive option by providing a more direct route between the ports on the eastern and western sides of the country. • To provide more ready access to high speed rail passenger rail services between Scotland, London and continental Europe. • To improve the capacity and reliability of trans-Pennine rail services by creating an additional route to the Hope Valley Line.